Deciding to make the switch to cloud and choosing the right cloud platform are just the beginning of your organization’s journey with cloud computing. Cloud computing offers many benefits to small and medium-sized organizations, however, it’s critical to implement best practices when phasing a cloud platform into your business model. 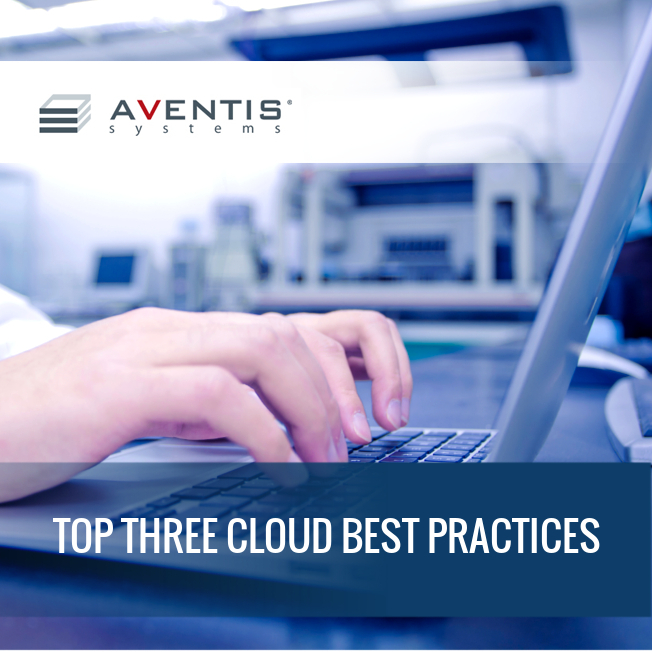 Aventis Systems recommends three cloud best practices for getting the most out of your new computing. These best practices include training your employees, securing your cloud and preparing for disaster. When transitioning your organization to cloud computing, start with the people who will be using it. Train your staff as quickly as possible. According to the 2013 Global Cost of a Data Breach Study conducted by Symantec and Ponemon Institute, nearly 65 percent of data breaches were attributed to technology and human errors. For this reason, businesses should place more focus on their internal processes. How to recognize and avoid phishing attacks. The importance of using complex passwords. Data management practices to ensure sensitive data is stored in a secure location. Staying current with software updates. Employees should be trained upon hire and at least once a year in order to meet PCI Compliance. Since employees have different learning styles, we also recommend using diverse training methods to ensure that everyone gets the most out of the sessions. Training methods could include in-person sessions, virtual lessons or on-demand training. To accommodate diverse learning styles use less technical communication that is easily comprehended and translates well to your goals. In addition, make sure that the training is relevant and interesting. Training should be focused on the real everyday risks involving security measures. If you do not have the resources or expertise to provide training internally, a third-party vendor is recommended. Aventis Systems offers security consulting services that include personnel training. Security is something that was likely discussed when choosing your cloud provider. However, it is still important to stay up-to-date on securing your cloud. Keeping data secured can be a challenge for small and medium-sized businesses with smaller IT departments, but by following these preventative steps, you can be proactive in your protection. Simply put, know how your cloud computing environment works. This can be a daunting task, but understanding where your data is stored and how it is protected will give you a better understanding of what you need to do to secure the information you are storing on the cloud. Speak to your cloud provider and read all materials provided about your service. Get serious about passwords. According to Info Security, 90 percent of passwords take less than two minutes to crack. To prevent this, choose complex passwords and keep them private and stored in secure locations. Encryption is one of the best ways to protect your data. You can use encryption software or a cloud service to provide local encryption and decryption of your files. This way all of your information has its own protection in the cloud. In addition to the previously mentioned steps, avoid storing your most critical information in the cloud. If you can, keep your sensitive information away from unsecured virtual storage. Lastly, make sure to backup your data in the event of an unexpected system failure or power surge. Even with today’s advanced technology, systems can and will go down. In order to avoid data loss from unforeseen disasters, have a backup plan in place. This is an often overlooked part of cloud computing, but it is an easy way to protect all of your data and preserve some peace of mind. Backing up your data is important for business function, but it is more about securing your business’ reputation. Losing a customer’s information will likely result in also losing their trust and business. If in doubt, backup what you are working on as well; it can save you headaches in the future. In order to reap the productivity gains of cloud computing, it's important to follow these best practices. After implementing training programs and security measures, test them to make sure they are effectively meeting your business computing needs. You have now successfully transitioned into cloud computing. Hopefully these steps will take your organization to the next level of cloud computing. If you have any questions or issues with your cloud service, contact us. We have helped small and mid-sized businesses, as well as education and public sector organizations, by designing customized solutions that meet unique IT needs. Our solutions engineers will work with you to ensure your organization captures the full benefits of cloud computing solutions. > Why Consider Virtualizing Your Network?